Plot Summary: After her grandmother passed away, high school student Ryō Machiko began living by herself. Although she recreated her grandmother's recipes perfectly, she felt that something was missing. However, when a girl named Kirin begins visiting her home, she realizes that company makes any meal taste better. 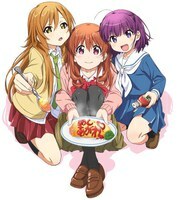 Together with their friend Shiina, they enjoy many different kinds of delicious foods together.